Planning for natural disasters involves dealing with a lot of uncertainty, but advances in artificial intelligence may allow computers to take some of the guesswork out of the planning process. NPR's science correspondent Joe Palca traveled to Palo Alto, Calif. That's where a startup company is using machine learning and artificial intelligence to advise fire departments on how best to respond in an earthquake. JOE PALCA, BYLINE: Computers may play a role in preparing for and responding to natural disasters like earthquakes, but Nicole Hu knows they'll never play the most important role. NICOLE HU: The true heroes on the ground are the ones who actually know how to respond in terms of a disaster. PALCA: Hu is chief technology officer for a startup called One Concern. Her company is trying to make the job of first responders easier when an earthquake hits. I met Hu at her well-appointed, open-plan office in Palo Alto. We sat in her conference room as she sketched out how she is using artificial intelligence to do this. The key is providing computers with mountains of data relevant to predicting what's at risk in an earthquake - for example, data about the built environment, things like homes and buildings. HU: We have almost every information about most buildings in the United States. PALCA: What they're made of, when they were built, how likely they are to collapse when the ground starts shaking. There's also a lot of data about the natural environment. HU: What is the soil like? What's the elevation like? What's the general humidity like? PALCA: What's the underlying geology in an area like? All this data lets you build maps of what regions are most vulnerable in an earthquake. HU: Machine learning does help you do that. PALCA: Here's basically how it works. The computer takes all this data and makes a prediction about what will happen in an earthquake. It then uses data from past earthquakes to see whether its predictions are any good and then revises its predictive models. In other words, it learns as it goes. 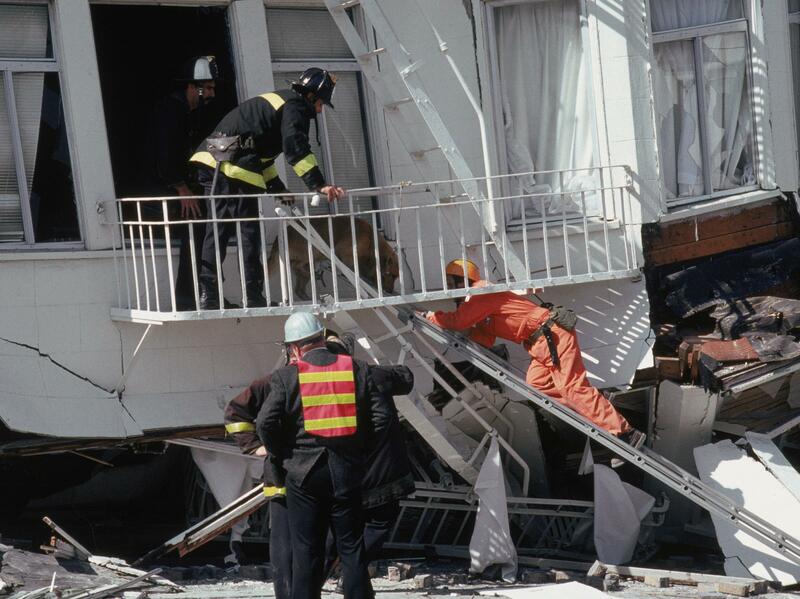 Stanford University earthquake engineer Gregory Deierlein is an adviser for One Concern. He says one of the most remarkable things about the company's software is it can incorporate data from an earthquake as it's happening and adjust its predictions in real time. GREGORY DEIERLEIN: Those sort of things used to be research projects where after an event, we would collect data, and a few years later we'd produce new models. PALCA: Now the new models appear in a matter of minutes. Still, even though he's an adviser to One Concern, Deierlein says he doesn't know all the details of their approach. DEIERLEIN: Like many kind of startup companies, they're not fully transparent in everything they're doing. I mean, (laughter) that's their kind of proprietary knowledge that they're bringing to it. PALCA: Even if their methods are a bit opaque, some first responders are already convinced the software will be useful. I went to visit Fire Chief Dan Ghiorso of the Woodside Fire Protection District just up the road from Palo Alto. Ghiorso's district is about 32 square miles. DAN GHIORSO: So it's quite a large district. And we have the San Andreas fault running a couple hundred feet behind us. PALCA: Ghiorso says in the past when an earthquake hit, he'd have to make educated guesses about what parts of his district might have suffered the most damage and then drive out and have a look. The software changes that. He calls up a map of how his fire district might look if a 6.9-magnitude earthquake struck nearby. GHIORSO: Instead of all of it being blue where there's no damage, we have some of what they call level two and then level three. PALCA: Level three are areas predicted to have bad damage. They show up as red on the map. GHIORSO: So what I would do is, if this was a live scenario, I would look at this and say, hey, we need to get some people out into those red areas and see, what is the damage? Is there really damage? PALCA: Now, these are just computer-generated predictions. But Ghiorso says he's sure they'll be extremely useful in a real disaster for showing where help is needed the most. GHIORSO: Instead of me taking my educated guess, they're putting science behind this. So I'm very confident. PALCA: Unfortunately, it's going to take a natural disaster to see if his confidence is fully justified. Joe Palca, NPR News. Transcript provided by NPR, Copyright NPR.